January 12th, 2012 - Toyota, the manufacturer of the number one selling lift truck in North America, today announced its Columbus, Ind., manufacturing plant, Toyota Industrial Equipment Mfg., Inc. (TIEM), has been selected by IndustryWeek Magazine as one of the 10 Best Plants in North America. The competition is part of IndustryWeek’s annual search for North America’s manufacturing excellence. 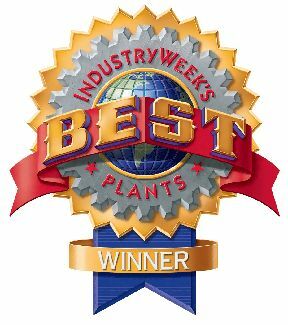 As the 22nd annual salute to the best plants in North America, the IndustryWeek Best Plants Award recognizes plants that are on the leading edge of efforts to increase competitiveness, enhance customer satisfaction, and create stimulating and rewarding work environments. The program also aims to encourage other manufacturing managers and work teams to emulate the honorees by adopting world-class practices, technologies, and improvement strategies. “At the core of Toyota’s philosophy is continuous improvement, and being named among North America’s top manufacturing plants is an immense honor for the company and dedicated associates at TIEM,” said Toshiya Yamagishi, president of TIEM. TIEM designs, manufactures and supplies Toyota lift trucks and parts associated with Toyota lift trucks and tow tractors, and assembles motor vehicle parts and accessories. Since the first Toyota lift truck rolled off the line more than 20 years ago, TIEM associates have built more than 400,000 lift trucks and Toyota has steadily penetrated the U.S. market to achieve the ranking of the number one lift truck supplier for the last decade. Today, the majority of all Toyota lift trucks sold in North America are produced at TIEM. A panel of IndustryWeek editors, manufacturing experts and other knowledgeable persons selected the 2011 Best Plants winners based on a scoring system on the factors surveyed, ranging from management and employee practices, to safety, customer focus, technology and environmental stewardship. In addition, each plant had to provide documentation of its achievements and participate in a site visit by the judges. The 10 winning manufacturing plants, selected from all nationwide entrants, are featured in the January 2012 issue of IndustryWeek. About Toyota Industrial Equipment Mfg., Inc.
Quality is the hallmark of the Toyota Production System practiced at all Toyota manufacturing facilities, including TIEM. TIEM, a zero-landfill facility, is a member of the National Safety Council, complies with the ISO 14001 standard from the International Organization for Standardization, and has been honored for its environmental management systems and dedication to continuous improvement. Toyota's commitment to excellence in customer service extends throughout the U.S. and Canada. With more than seventy authorized Toyota Industrial Equipment dealers and more than 220 dealership locations throughout North America, Toyota dealers offer comprehensive customer service and support, including one-stop shopping for both new and used lift trucks, rentals, parts and service, fleet servicing and financing. For more information on TMHU, please visit www.toyotaforklift.com, www.facebook.com/ToyotaForklift or twitter.com/ToyotaForklift or call 1-800-226-0009.